Editor's Note: The resort is closed. 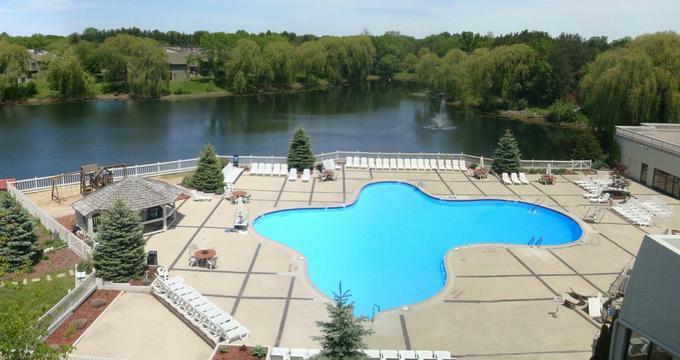 Nestled in the heart of Oconomowoc, Wisconsin, the Olympia Resort: Hotel, Spa & Conference Center is a laid-back conference hotel in Lake Country. Surrounded by the scenic Kettle Moraines and several pristine recreational lakes, the laid-back hotel, which dates back to 1973, offers comfortably furnished guest rooms with en-suite bathrooms, private balconies, and modern comforts, and upgraded suites have spacious living rooms with fireplaces and in-room whirlpool tubs. Upscale facilities at the resort include indoor and outdoor swimming pools, a casual grill and a relaxed lounge with a bar, a nightclub that offers live entertainment, including karaoke, and a golf simulator. A modern convention center with over 45,000 square feet of flexible function space has 22 meeting rooms and state-of-the-art amenities, and there are a fully equipped gym and full service spa. Conveniently located midway between the surrounding areas of Chicago, Green Bay, Minnesota, Madison, Milwaukee, and Wisconsin Dells, the Olympia Resort: Hotel, Spa & Conference Center offers a wealth of opportunities for enjoying local attractions and activities, events, dining, shopping, and recreation in the area. The Olympia Resort: Hotel, Spa & Conference Center features 190 spacious guestrooms and suites furnished in fresh neutral tones and contemporary décor. All guest rooms and suites have one or two king or queen-size pillowtop beds dressed in high-quality, deluxe linens and soft pillows, and en-suite bathrooms with bath and shower combinations, whirlpool tubs (suites only), thick towels and bathrobes, and branded bath products. Modern amenities include flat-screen televisions with cable channels and DVD players, mini-kitchenettes and wet bars with mini-fridges, microwaves, Keurig coffee makers, irons and ironing boards, telephones with free local calls, hairdryers, and complimentary wireless Internet. Upgraded suites include the Bridal Suite, the Whirlpool Suite, and the Dedication to Harley Davidson Suite. Rick’s Lake Country Grill is a casual restaurant that serves breakfast buffets on the weekends, specials for dinner on Saturday nights, Friday Night Fish Fries, and other special dinners. A complimentary breakfast is served every morning and includes coffee, tea and hot beverages, fresh fruit and juices, cereals, granolas and yogurts, egg dishes, and freshly baked pastries, and bread. Cricket’s Lounge is an elegant gathering space where guests can enjoy cocktails and signature drinks in the evenings in a stylish and sophisticated environment. Amenities and guest services at the Olympia Resort: Hotel, Spa & Conference Center include indoor and outdoor swimming pools, a casual grill called Rick’s Lake Country Grill, and a relaxed lounge with a bar, a nightclub that offers live entertainment, including karaoke, and a golf simulator. A modern convention center with over 45,000 square feet of flexible function space has 22 meeting rooms and state-of-the-art amenities, and there are a fully equipped gym and full service spa. Other services include a complimentary breakfast is served every morning, a 24-hour front desk service, and a fully-equipped business center with computers, printing, copying, and faxing services. The Olympia Resort: Hotel, Spa & Conference Center offers over 45,000 square feet of flexible meeting space for private functions, conferences, and conventions, weddings, retreats and reunions and expos. There are 22 distinct function rooms which are fully equipped with state-of-the-art audiovisual and sound systems, and that can accommodate from 12 to 1,200 people. Local activities and attractions include nightlife and entertainment at the Club Indigo at Olympia Resort, the Oconomowoc Arts Center, the Oconomowoc Festival of the Arts, the Summer Stage Theatre, the Fireside Dinner Theatre, the Oconomowoc Historical Society and Museum, Old World Wisconsin, and the Ten Chimneys. Sports and activities range from the STiKS Academy and Sports Training, the Lapham Peak Park, various hiking and walking trails, several golf courses, including the Erin Hills Golf Course, the Paganica Golf Course, the Western Lakes Golf Course, and the Kettle Moraine Golf Course.